InfoCard PIN stands for Personal Identifier or simply Card password. To recover a Card PIN (if one was set), it's not a bad idea to first check the number against simple combinations (use the 'Check Simple PINs >>' button). 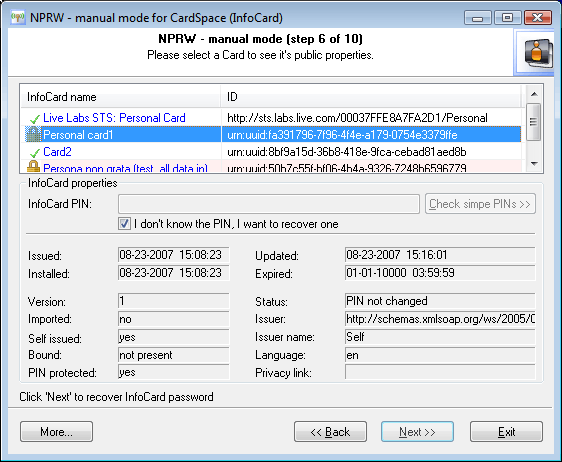 In one of the latest versions, the software has adopted the Passcape Password Prediction mechanism, which is involved in this check. The idea of the trick is that the more the more passwords have been found before the moment (no matter which ones), the more effective it will recover the rest of the passwords. The search will take less than a minute on a moderate computer. Suppose, we haven't recovered the PIN; what can we do next? Next, the only way to recover the PIN is through the search or attack. What does that mean? Select the option 'I don't know the PIN, but want to recover one' and then click 'Next >>' and move on to the recovery of the PIN. At the same time, you will see what the attack is.